Happy Fourth of July! As we celebrate our freedom we must remember that the price of liberty is eternal vigilance. We continue to fight overdevelopment. While the developer of a supertall building won special treatment so that our community's hard-won rezoning wouldn't apply to his building for billionaires, we will bring the fight to court. We passed an $89 billion budget for the city that invests in our children, libraries, and parks while making transit more affordable and taking a look at why property taxes are higher in this neighborhood than many others. As we invest in schools, we broke ground on 180 new pre-kindergarten seats that should be ready for next year, stood up for specialized high schools and congratulated graduates from more than a dozen schools, sharing nothing less than the secret of life, spreading a message of tolerance, and hoping to inspire the next generation. We are working to make our streets safer for pedestrians, cyclists, and drivers by giving everyone their own safe space. On Monday, July 9th, the Department of Transportation will be proposing a parking-protected bike lane to protect cyclists on Second Avenue below 68th Street and crosstown bike lane pairs on 65th and 66th as well as 84th and 85th Streets. I hope you will join me for Shakespeare's Romeo and Juliet in Carl Schurz Park nightly at 7pm from July 17th through the 22nd. As I continue the second half of my paternity leave through the month of July, I took time out to fight for Universal Childcare, paying our childcare workers equitably and keeping children from being separated at the borders. 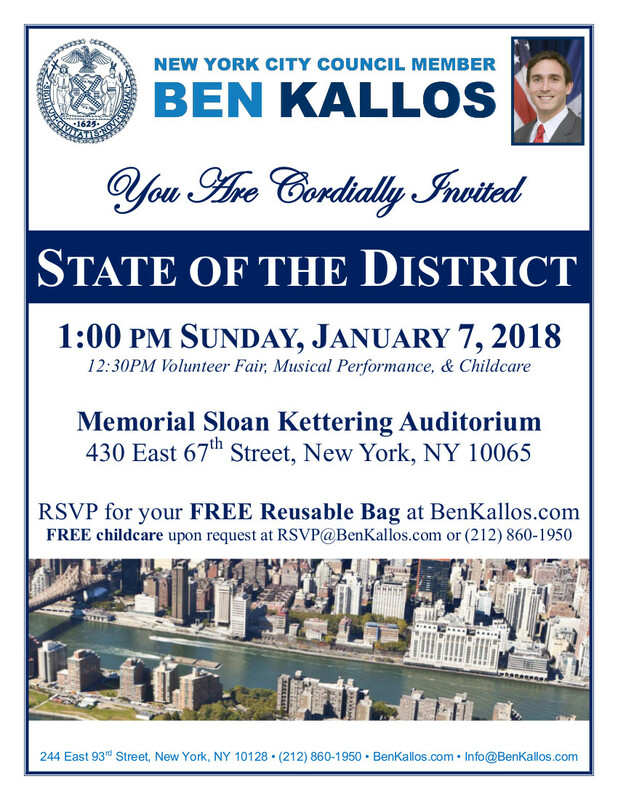 Although I am on leave, my staff is still there to help every day from 9am to 5pm, Monday through Friday at 212-860-1950, or you can email me at BKallos@BenKallos.com. Congratulations to the winners of the Participatory Budgeting vote on how to spend one million dollars! Technology for schools and our libraries were the big winners this year. Join our fight at our annual Over Development Forum on June 14 at the Lenox Hill Neighborhood House. Get updates from every elected official at our Annual Roosevelt Island Town Hall at the Chapel of the Good Shepherd. With the warm weather finally here we are activating our parks with Family Day at John Jay Park, Skate Night at the Stanley Isaacs Playground, and more of our Outdoor Movie series now with Deep, Wonder Woman, and Despicable Me 3. As you may know, I support Paid Family Leave and believe that the only way to change the current dynamic of men taking one day of leave for every week their wives take is to lead by example. Earlier this year I was blessed with the birth of my first child. I took a portion of my paternity leave and have staggered the rest with my wife so we could both continue our careers. Beginning June 11, I will go back on paternity leave through late-July. In the meantime, I will see residents at graduations, annual meetings, and some previously planned special events. My office will remain open and available for anything you need. I hope everyone has a wonderful start to the summer, congratulations to all our new graduates, and happy Father's Day. Outdoor Movie "Despicable Me 3"
During the month of April in honor of Earth Day I focused on ways to help protect the environment. We are also working to activate our neighborhood parks. My office has partnered with the New York City Parks Department to bring our community a variety of events and activities for residents to enjoy the outdoors. The events will include Outdoor Movie Nights and a Live Jazz Concert at Andrew Haswell Green Park. You are invited to our annual Tenants’ Rights Forum where you will have a chance to ask questions of experts, learn about your rights as a tenant, the Senior Citizen, and Disabled Rent Increase Exemption (SCRIE), and how to support a rent freeze in 2018. P.S. To all the mothers (including a very special new one) Happy Mother’s Day! Chag Sameach and Happy Easter for those who celebrate. Activism is also core to our democracy and I had a chance to support the next generation joining thousands of New Yorkers for National Walkout Day and at the March For Our Lives, advocating and marching in favor of gun common sense laws to keep us safe across our nation. Join us for our annual Earth Day Forum to get a free reusable bag along and learn how to take action for the future of our city and planet. After you file taxes please join us and the Upper Green Side for a Shred-A-Thon. P.S. First Friday is canceled this month in observance of Passover. For those who celebrate, Happy Purim, as the weather gets warmer and you may be preparing for the celebrations of Passover and Easter we wish you the best. My wife and I were blessed this month with a baby girl. Thank you to everybody who has sent congratulations. Your support has meant a lot to me and my new family. I believe every New Yorker should have access to paid family leave, and I hope more men who often don't will start to take full advantage of their leave, which is why I joined with Brooklyn Council Member Antonio Reynoso, who is also on paternity leave, to publish an op-ed in City and State and lead by example. I look forward to returning from the first half of my family leave on March 12 and will complete my leave over the summer. Please remember our city’s conflicts of interest rules prohibit any gifts. Even while on paternity leave you might be surprised with the work my office has gotten done during the month of February. We reintroduced legislation to get scaffoldings down and protect tenants from reporting companies that create blacklists of people exercising their right to take a landlord to Housing Court. And we cut the ribbon on 21 units of 100% permanently affordable middle-income housing right here on the Upper East Side. As our nation struggles with the scourge of gun violence in our schools, I continue to fight alongside our Congress Member Carolyn Maloney who has been fighting for common sense gun control for decades. I also encourage residents to join victims of gun violence and activists at the March for Our Lives scheduled for March 24th in Washington D.C. Please join me for our annual Sotheby’s Student Art Show or compete in the Ben Kallos Chess Challenge. It is with great joy that I am able to share that my wife and I are expecting a child this week. As I fight to ensure every New Yorker have access to paid family leave, we must ensure those who can take leave particularly men who don't take their full leave, actually do take it. The best way to do so is for each of us to seek to erase the stigma, lead by example and take paternity leave. I look forward to seeing you in March. Last month, we announced 400 new pre-kindergarten seats, signed a law to turn down the volume on after hours construction noise, and passed a law to get thousands of affordable homes back on the market. In February, you will have an opportunity to comment on the location of LinkNYC terminals, comment on the design for a new senior space I funded at John Jay Park, and fight cancer with the American Italian Cancer Association at our NO COST Mammogram Van. Please consider joining our advocacy to get Big Money Out of New York City Politics or to bring accessibility to the Lexington Avenue East 86th Street Subway Station. Thank you to all the residents who helped make our first four years a success and joined me at this year’s State of the District where I was sworn in for a second term. Thank you also to hundreds of residents who joined us and asked questions at the Mayoral Town Hall. P. S. First Friday and Brain Storm with Ben are canceled due to my paternity leave in February and March, my office remains open Monday – Friday 9 a.m to 5 p.m except on Federal holidays. Join Congress Member Maloney, Borough President Brewer, and over a hundred neighbors warming up with a free cup of hot coffee, bagels with Ben, and learn what's going on in the neighborhood and how to get involved at our annual State of the District tomorrow.